While a 70-200mm lens is seldom my first choice for wildlife photography, it can work quite well if used for tolerant and/or large animals, especially if used on an APS-C format body. In this case, the camera was full frame and the fawn was quite tame. What tame does not directly translate to, however, is still. While the adorable little white-tailed deer fawn had no problem with my presence, it was constantly moving and often moving very fast. I had a fortunate break when it bounded over the small hill above me, stopped and turned its head. I quickly adjusted the AF point selection slightly to the eye and captured a burst in AF-C focus mode. At 200mm f/2.8 with a close subject and relatively distant background, especially on a full frame camera body, the subject pops from the melted background. At 20 fps, I had many images to choose from as this camera can deliver a sometimes-overwhelming number of images. I liked this specific image for a couple of reasons. The first is of course that the eye is in focus, but that wasn't much of an issue while the fawn was stopped. 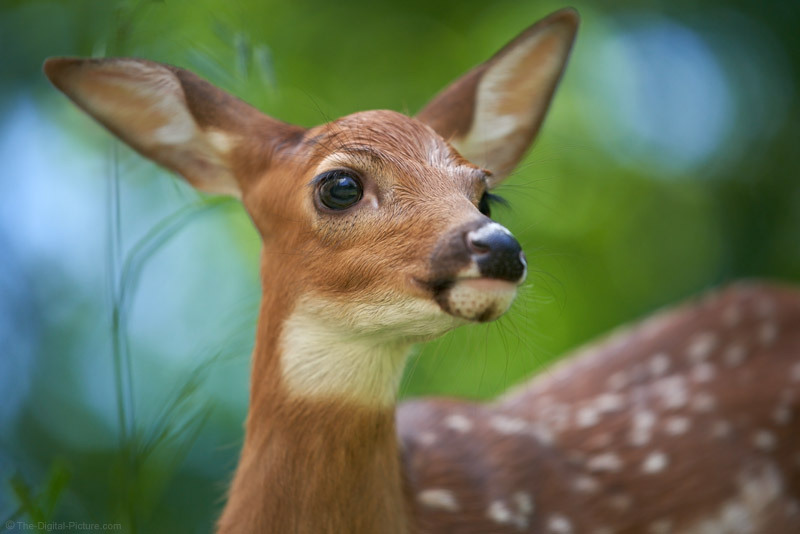 Nice also was the beautifully-blurred, void-of-distractions background with spring colors that attractively contrast the fawn. I also like that that both ears are fully-contained in the frame and that are very few lines of strong contrast leaving the frame is usually an aspect I like. Lines are often an important compositional element and that most lines in this image point in the general direction of the eye (or to another line in that direction) make them "leading". The extremely versatile 70-200mm f/2.8 lens is one of the most important lenses in many kits. Going beyond 200mm with an f/2.8 aperture results in a substantially higher price tag, making the 200mm focal length the longest affordable f/2.8 option for a large number of photographers. Specifically in this case, the Sony FE 70-200mm f/2.8 GM OSS Lens, though not inexpensive, is currently the best choice for kits based on Sony Alpha cameras. 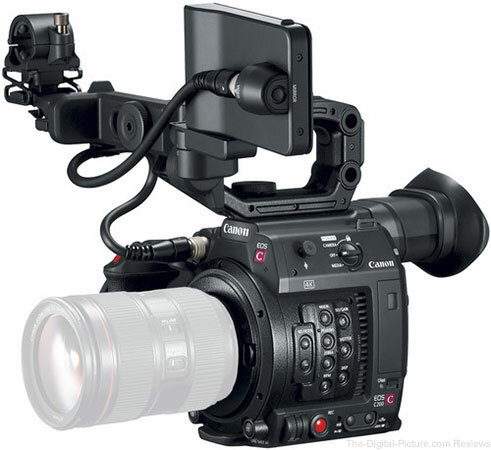 B&H carries the Canon EOS C200 Cinema Camera. Vignetting, flare and distortion test results along with specs and measurements have been added to the Tamron 24-70mm f/2.8 Di VC USD G2 Lens page. Notably (and disappointingly) missing are the image quality results. We captured a full set of ISO 12233 test chart images from this lens using three cameras, processed and loaded them into the image quality comparison tool ... and I had a hard time believing what I was seeing. Unfortunately, not for a good reason. The corner image quality looked very bad, worse than I remember seeing in a long time. Closer analysis of the RAW images indicated that all four corners were performing relatively similarly in terms of image quality, but I still have a hard time believing that the results are indicative to how this lens should perform. Therefore, I have taken the results down and await delivery and testing of another copy of the lens. Assuming that the lens indeed has a problem ... while 100% perfection cannot be expected in lenses, most disturbing to me is that we had a similar problem with this lens' predecessor, the Tamron 24-70mm f/2.8 Di VC USD Lens. As explained in that review, it took two lenses and two repairs (the second repair appeared to be resolved with a replacement) to get a good version of that lens. Big coincidence? Or quality control problem? It is painful to think of the number of hours we have spent testing these bad lenses. 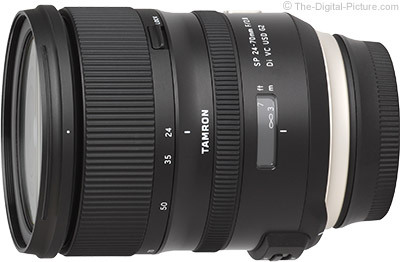 The Tamron 24-70mm f/2.8 Di VC USD G2 Lens is in stock at B&H | Amazon | Adorama | WEX (preorder). But, you might want to wait for our second set of tests before making your decision to go with the Tamron G2. So what if I told you there was a second dimension of data in your photos that can help you make the most accurate color correction ever? You probably wouldn't believe me because it is a bold statement and you might not be as into Sci-Fi as I am. However, this other dimension is not in a galaxy far far away as it sounds, it is as simple as inverting your photo to access it. B&H has the GoPro HERO6 Black in stock with free expedited shipping. Besides the HERO6 Black, GoPro also announced Fusion, an action camera capable of capturing 360-video. While Fusion is arguably the more exciting GoPro announcement today, it isn't available for purchase (or preorder) at authorized retailers just yet. Upper Saddle River, N.J. (September 28, 2017) – Vitec Photographic, world leader in the photography and videography, imaging equipment and accessories industry has announced its collaboration with Sony, a leading manufacturer of audio, video, imaging, game, communications, key device and information technology products for the consumer and professional markets. This agreement will consolidate both companies position as the innovation leaders in their respective sectors. The collaboration is announced on the occasion of the Gitzo 100 years anniversary event in Tokyo, which represents the perfect moment for communicating the common values of innovation and premium quality. The collaboration will begin with a brand new line of products developed for α, Sony’s interchangeable lens camera system, that will be launched in 2018. First to be released will be a special version of the Manfrotto Befree tripod, a world class best seller in the traveller segment and the premium lightweight companion solution for compact system camera, unveiling at PhotoPlus in New York on October 26th. The full range will include new Manfrotto and Gitzo tripods, plates, photo and video heads that are targeted at professionals who demand outmost quality and high performance. A customized version of Digital Director will complement the new range of products that will be showcased at events and tradeshows worldwide throughout 2018. B&H carries Gitzo and Manfrotto products. When packing up for my exodus from Savannah, GA with the center of hurricane Irma forecasted to hit the city dead on (it later hit farther west), I made sure to pack as much photography equipment as possible (we all have our priorities). One of the things I brought with me was my infrared-converted EOS 7D. Deciding not to brave the flood of traffic heading to Atlanta, we instead headed west to New Orleans to stay with family who resides there. One of the places I visited while in New Orleans was The Fly (or, more precisely, Butterfly Riverview Park), a waterfront area located in southwest Audubon Park along the Mississippi River. The Fly is a popular hangout for college students, who typically enjoy sunbathing and other outdoor activities in the manicured lawns next to the river. While the hordes of college students were certainly interesting, a few isolated trees on the opposite side of the road from the river bank caught my attention. With my IR-converted 7D available, I photographed a few of the trees. My favorite appears at the top of this post, and another image I enjoyed can be seen below. 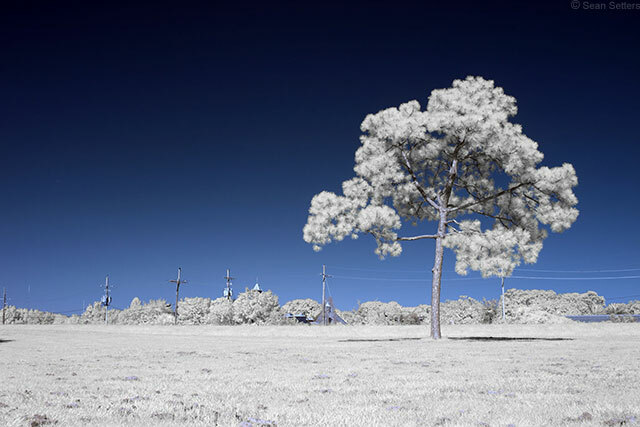 Photographing isolated trees on flat land set against a bright blue sky with a Super Color IR-converted camera creates a dramatic contrast that helps draw the viewer's eyes directly to your subject. If photographed with a normal camera, the scene would have much less impact. Upgrading DSLRs in the near future? 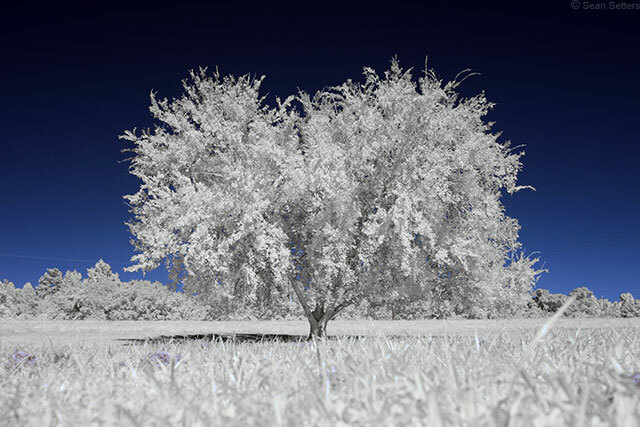 Consider converting your older DSLR to an infrared camera to add an inspiring and creative tool to your kit. One of my favorite features in Adobe Lightroom is the mobile syncing function. My favorite use in addition to syncing to the mobile app is the ability to create web galleries that automatically sync to your edits. This is particularly useful in collaboration situations when working with a client. In this tutorial I will show you how to create these. B&H carries the Sony a9 (Sony a9). B&H has the Canon EOS C200 EF Cinema Camera in stock with free expedited shipping. The German Roamers are a group of 14 photographers who are some of the best German outdoor photographers on Instagram. They love showing their audiences the wonderful nature of Germany but they have also created a place for inspiration, exchange and community. In addition, the quality of photography plays a central role. All members embody a new visual language, which is not found in classical landscape photography. It is about transporting passion and authenticity in the images, building a link to the respective motif and going new ways - in the truest sense of the word. Thus, the German Roamers would like to be perceived as a collective that understands the world around them in first-class, unique images. In Germany as well as all countries of the world. Powerful CD and DVD burning come together with impressive video editing tools and a redesigned interface, offering an easy-to-use and complete suite for all your digital media needs. OTTAWA, ONTARIO – (Sept. 26, 2017) – Introducing Roxio Creator NXT 6 and Roxio Creator NXT Pro 6, the latest versions of Roxio's complete burning and creativity suite that feature a diverse range of new video editing capabilities to elevate your next video project. With new MultiCam Capture, support for 360 video, Motion Tracking, and Track Transparency, the new Creator offers everything you need to produce great-looking, dynamic, and fun-to-watch videos. Plus, with a redesigned and streamlined interface, it's even easier to achieve all your digital media projects, from making movies to enhancing and managing your photo collections, burning discs, and sharing on the latest devices. For anyone looking to get creative with video, Creator NXT 6 introduces more creative possibilities than ever with the newly enhanced VideoWave editing software. YouTubers and videomakers can use new MultiCam Capture to both record and combine footage from up to two video streams, and seamlessly switch between angles using the Multi-Camera editor. Layer tracks with new Track Transparency to create superimposed effects or custom fade-in, fade-out transitions. Use new Motion Tracking to add text or graphics to label or blur out a moving object. And if you're capturing 360 videos, now it's easy to convert 360 footage to standard video to playback on virtually any video player. With support for more popular video formats, including HEVC, Roxio Creator NXT 6 has you fully covered and ready to edit. "With new updates like MultiCam Capture, support for 360 video, and dynamic features added to VideoWave, Creator offers exciting editing options that are sure to please to anyone looking to do more with video. Whether you want to guide your audience through your latest action cam adventure or deliver a great tutorial video on YouTube, you'll now find everything you need to make engaging movies in one affordable and easy-to-use suite," said Michel Yavercovski, Senior Director of Product Management for Roxio. NEW MultiCam Capture: Simultaneously capture great-looking video footage from two sources at once, like your camera and screen, or a webcam and a separately recorded audio track. There's no post-capture syncing required, making it seamless to quickly create software training, cooking demos, and unboxing videos! NEW 360 Video Support: Be the director and set a path through the action! Convert 360 video for playback on standard devices and control the angle your audience sees. NEW Track Transparency: Adjust the opacity of tracks and see two or more scenes at the same time. Get creative and easily add custom fade-in, fade-out, or superimposed effects. 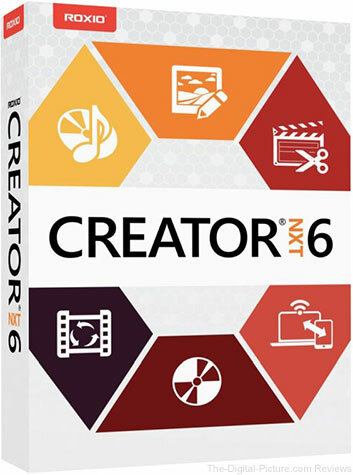 Choose Roxio Creator NXT 6 Pro and get all the creativity and versatility of Creator NXT 6, plus even more powerful Multi-Cam editing, advanced photo tools, and secure, encrypted disc burning. Includes more than $200 worth of valuable extras! NEW PaintShop Pro X9: Complete photo editing and creative design, now with new enhancements including time-saving project templates, a new Screenshot tool, Gradient Fill controls, enhanced Text tools, and more. NEW WinDVD 12: High-quality DVD, AVCHD, and media player for your computer. Roxio Burn 4 with encryption: Easily burn data on CD, DVD, and Blu-ray Discs just by dragging and dropping files and folders on the desktop. With the added power of encryption, password protect the confidential files you save on discs or USBs. MORE video power: Enjoy support for two additional camera angles in the Multi-Camera Editor (up to four cameras) and 14 nature video effects. Roxio Creator NXT 6 and Roxio Creator NXT Pro 6 are available now. Suggested retail pricing for Roxio Creator NXT 6 is $99.99 (USD & CAD)/ £79.99/ EUR 69.99. Suggested retail pricing for Roxio Creator NXT Pro 6 is $129.99 (USD & CAD)/ £89.99/ EUR 99.99. Registered owners of previous versions are eligible for upgrade discounts. All UK and European prices are inclusive of VAT. Amazon carries Roxio Creator NXT 6. 09/26/2017 – The BackLight 36L photo daypack continues MindShift’s commitment to providing outdoor photographers with rapid access to their gear. The new, larger backpack offers 10 more liters of capacity than its predecessor. Like the original BackLight, the back-panel opening allows access to gear when taking the pack off is not an option. The zippered compartment reduces the amount of dust, mud, ice or other elements coming in contact with gear, while keeping the pack and shoulder harness clean. 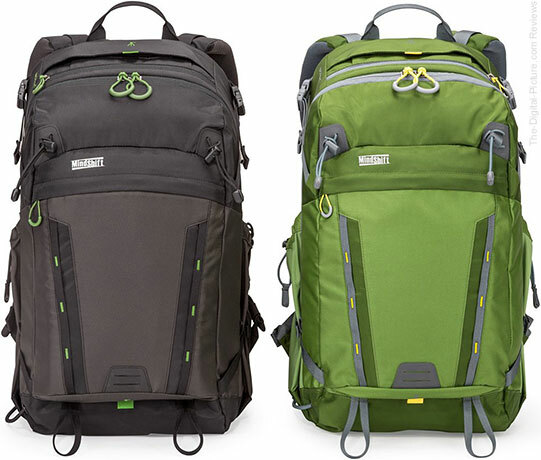 Available in two colors, Charcoal and Woodland Green, the BackLight 36L provides 11 liters of daypack capacity for personal gear, including separate dedicated compartments for a 10” tablet and 15” laptop. Even with its increased size, the backpack meets most International and U.S. carry-on requirements. 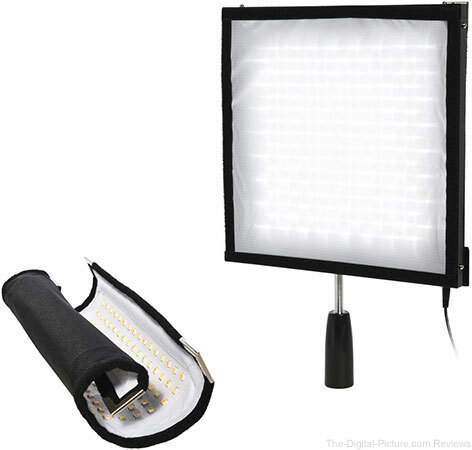 MindShift Gear Gear has the BackLight 36L in stock with free shipping. Measuring at 12x12” and just 16mm wide, the super slim Polaroid flexible LED panel mat weighs a mere one pound, making it easy to arrange and mold the light into your ideal position. Even at this ultra-portable size, the Polaroid flexible LED lighting panel delivers superb color reproduction similar in comparison to a natural light source; with 256 LEDs it can produce up to 4500 Lumens - nearly the brightness of direct sunlight. For those looking to achieve a softer look, the included special diffusion filter turns the brilliant LED light into a dreamy glow – perfect for portraits and product shots! Is the CompactFlash Memory Card on the Verge of Obsolescence? Every DSLR camera I have ever owned either solely utilized CF (CompactFlash) memory cards or, at the very least, supported the format in a dual memory card setup. But the writing on the wall is pretty clear. Canon switched to SD (Secure Digital) memory cards in their consumer-grade, Rebel-series cameras with the introduction of the Rebel XSi/450D in 2008. With the release of the 60D in 2010, Canon switched to the SD format for its enthusiast series cameras. For more than a decade, though, Canon has continued to support CF cards in their EOS-1, 5, and 7-series DSLRs. However, at some point, backwards compatibility must be sacrificed to get the most out of the cameras Canon designs for its professional market. We've already seen Canon migrate toward a faster memory card format with the release of the EOS-1D X Mark II (although a CF slot is provided alongside the new CFast slot). Which begs the question – have we seen the last Canon DSLR to feature a CF memory card slot? Note that most of the memory cards listed above (all but the CF format) have not reached their theoretical max speed and/or capacity limits, meaning you may expect even higher performance cards in the future. Another memory card format, CFexpress 1.0, has been announced but has yet to see widespread use. With higher resolutions sensors on the market, 4K recording in demand and camera manufacturers looking to maximize continuous shooting specs in their sports-oriented cameras, phasing out the CompactFlash standard makes a lot of sense. And the more I use the ubiquitous SDXC memory card, the less adamant I am that my next camera support the CF card format. The only question that remains is, "What kind of memory card will I need for my next camera?" Weigh in with your thoughts on the future of memory card compatibility in regards to DSLR/mirrorless cameras in the comments. 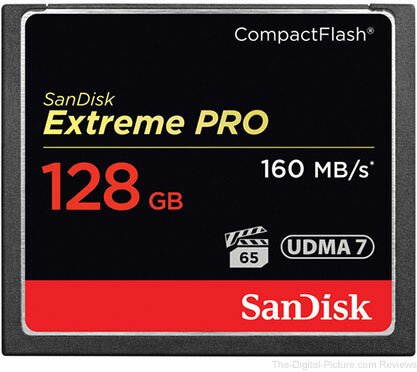 Permalink: Is the CompactFlash Memory Card on the Verge of Obsolescence?